I am working on some UFO’s that I inherited from my grandmother. She had several boxes of projects in various stages of completeness when she passed away. I have been working to complete some of the projects to give to the grand kids. My goal is to try to divide up what I have so that each family gets a lap size quilt. Since I only need 7, I think I will have enough pieces to work with. All but one of them are scrappy quilts. 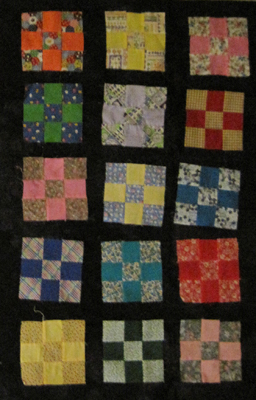 The projects that she was last working on were simple one patch designs using 5 inch squares of scrap fabric. I have one completed and she has enough squares cut and started for at least 1 or 2 more. Another box contained scrappy 9 patch squares. She saved her small scraps and using a piece of cardboard and a pen, traced squares on her scraps and cut them out with scissors. Many she already had sewn together, but there are several fabrics left in the box to make squares out of. 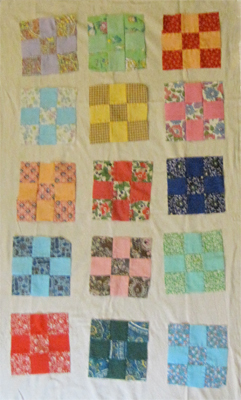 I think if I put some borders around the squares I can get 3 or 4 quilts out of these squares. So the question is, do I border the squares in Light Tan or Black? Click on the pictures to see the full view.